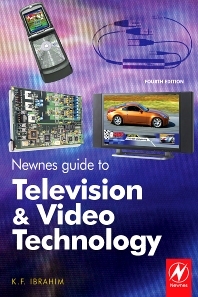 Newnes Guide to Television and Video Technology provides a full and comprehensive coverage of video and television technology including the latest developments in display equipment, HDTV and DVD. Starting with TV fundamentals, the bulk of the book covers the many new technologies that are bringing growth to the TV and video market, such as plasma and LCD, DLP (digital light processing), DVD, Blu ray technology, Digital television, High Definition television (HDTV) and video projection systems. For each technology, a full explanation is provided of its operation and practical application, supported by over 300 diagrams including schematic diagrams of commercially available consumer equipment. Where relevant, testing and fault finding procedures are outlined together with typical fault symptoms supported by photographs. The new edition has a number of useful appendices on microcomputer/microcontroller systems, test instruments, serial buses (I2C and RS 232), teletext and error correction techniques. The book is intended for students of electronics and practicing engineers. In particular, it will useful for students on vocational courses and service engineers as well as enthusiasts.